Only BioGuard® and Burnett Pools can ensure your pool water looks and feels spectacular every single day of the season. Click here to download our TruBlue Promise form! Pool care should be easy. Don’t know where to start? Well we’ve got you covered. 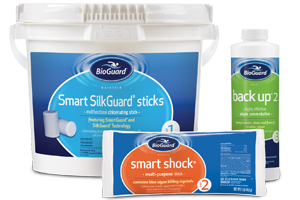 Follow our BioGuard system and you’ll be enjoying your pool instead of maintaining it. Sanitizers are key ingredients of proper pool maintenance. Chlorine and bromine keep the water clear, protected from bacteria and help control algae. 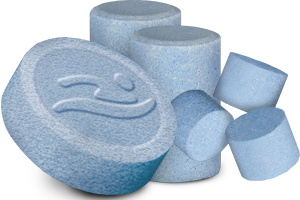 They are part of the BioGuard® 3-Step Pool Care System. Shocking your pool water is a needed step for proper pool maintenance. Shocks or oxidizers chemically destroy organic contaminants, remove combined chlorine and help restore water clarity. Water enhancers not only get rid of cloudy water and make it brilliantly clear but also help your filter work efficiently. Your pool is your investment. Having beautiful, sparkling clean water allows you to enjoy spending time in it. Enhancers bring out the beauty in your water and keep your filter working at maximum efficiency.